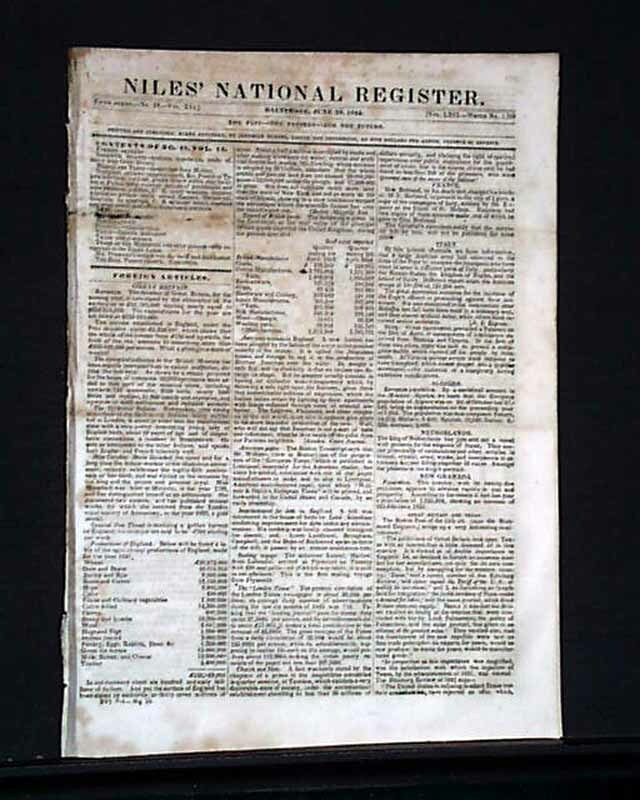 NILES' NATIONAL REGISTER, Baltimore, June 29, 1844 Included is a report stating that: "A party opposed to the longer control of Joe Smith (Joseph Smith), the Prophet...determined to establish a public press at Nauvoo, and the Nauvoo Expositor was issued accordingly." 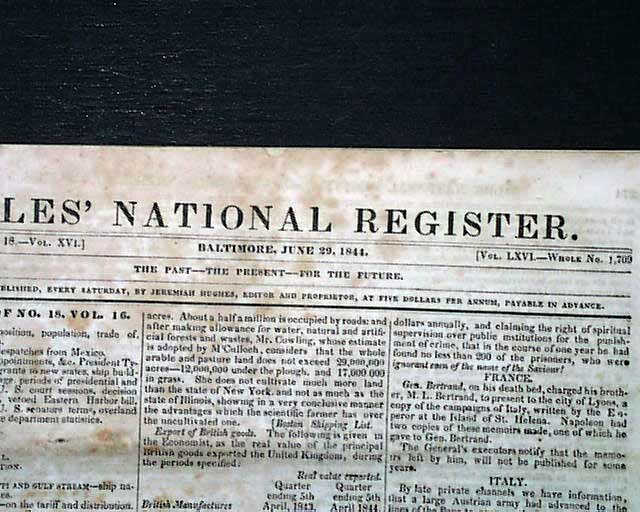 There is a second report which criticizes the establishment of the paper, stating that the city council declared the paper a nuisance and that the city marshals and police: "...took the press materials, and paper into the street and burnt them." 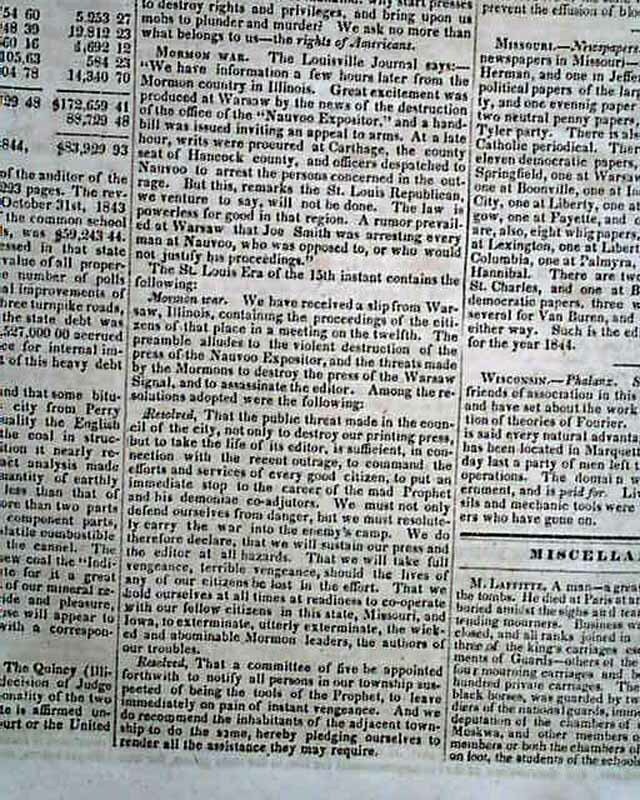 Under "Mormon War" is more about the destruction of the Expositor, plus word about a threat by the Mormons to destroy the press at Warsaw & more. 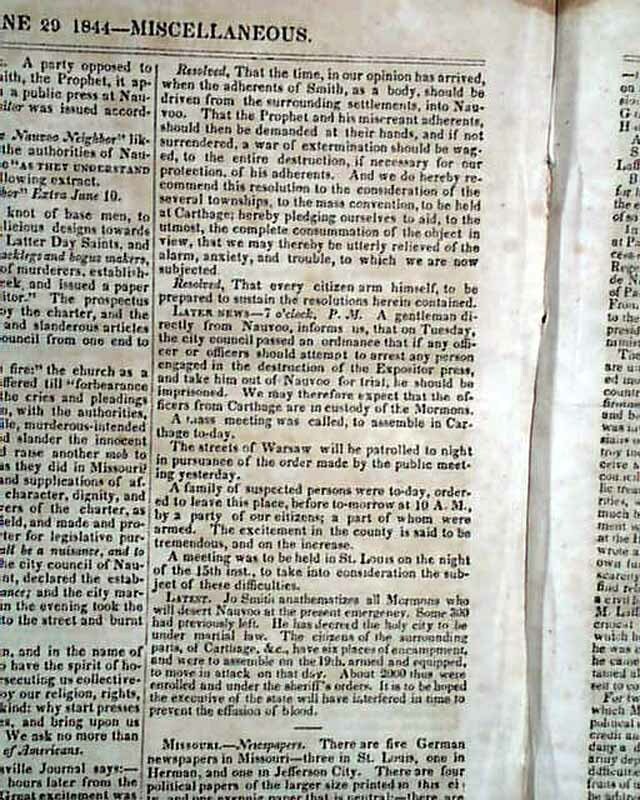 A few bits include: "...violent destruction of the press of the Nauvoo Expositor...and to assassinate the editor..." including several Resolves: "...that we will take full vengeance, terrible vengeance, should the lives of any of our citizens be lost in the effort...to exterminate, utterly exterminate, the wicked and abominable Mormon leaders, the authors of our troubles. Resolved, that a committee of five be appointed forthwith to notify all persons in our township suspected of being the tools of the Prophet, to leave immediately on pain of instant vengeance...That the time...has arrived when the adherents of Smith, as a body, should be driven from the surrounding settlements into Nauvoo. That the Prophet and his miscreant adherents..." and more. Sixteen pages, 8 1/2 by 12 inches, lite rubbing on the front page, otherwise in very nice condition.